I've smoked a bunch of briskets lately and I'm smoking another one tonight for Alexis' office party on Christmas Eve. 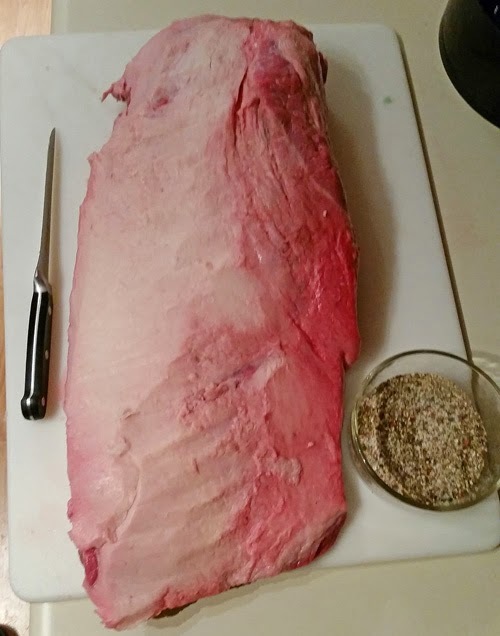 This isn't going to be a recipe post, just some random thoughts and notes for my BBQ friends. Also, excuse the photographs as most of these are mobile phone pictures taken on the fly. Since I have been smoking so many briskets, I have had some leftovers. 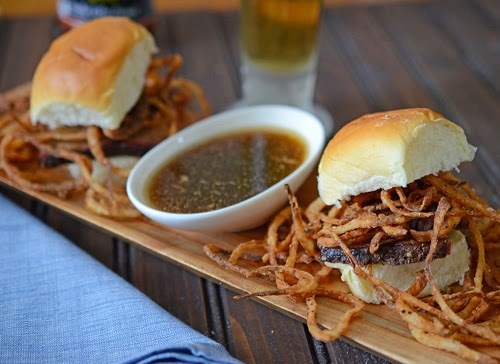 Here is a quickie that I made this weekend - beef brisket sliders with crispy fried "tobacco onions" and au jus. There is no tobacco in them, they are said to resemble strings of tobacco. I warm up slices of brisket in the leftover au jus over low heat. This is the best way to warm leftover brisket up - low, slow, and juicy. 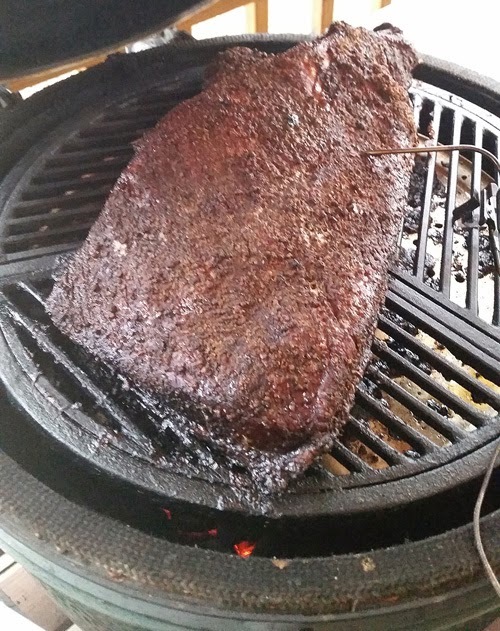 If you heat brisket up fast (microwave, high temps), it is going to dry out before it finishes warming up. 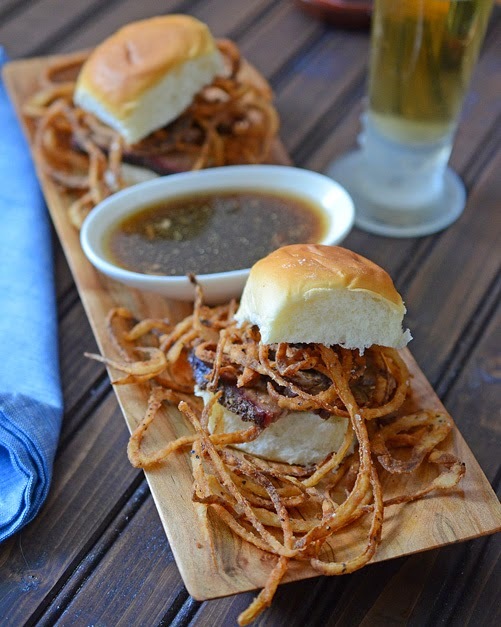 Plus, this way pieces of the beef and seasoning fall off into the au jus making what the Louisana folk call "debris" - the ultimate dipping au jus. The "tobacco onions" are just thin sliced onion dusted with flour, garlic pepper seasoning, and Creole seasoning and deep fried. Flat out awesome, leftovers are a good thing. 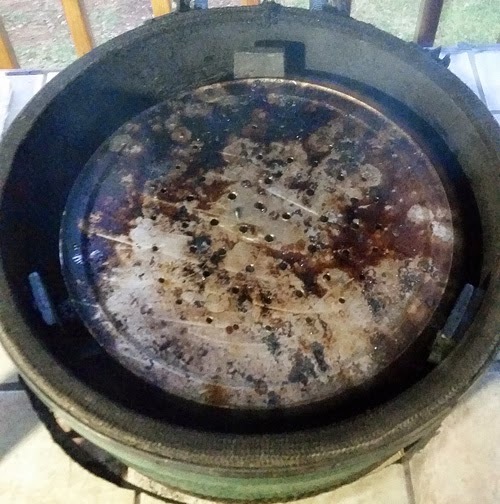 I used to not be able to get a decent smoke ring on my brisket when I cook them on my ceramic kamado grill (Big Green Egg, Grill Dome, Primo, Kamado Joe, Vision, etc). 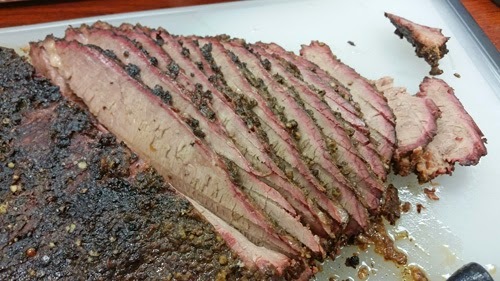 They still tasted great but when it came to appearance, they just couldn't compete with the smoke rings we'd get when we smoked them on our wood fired trailer pit. 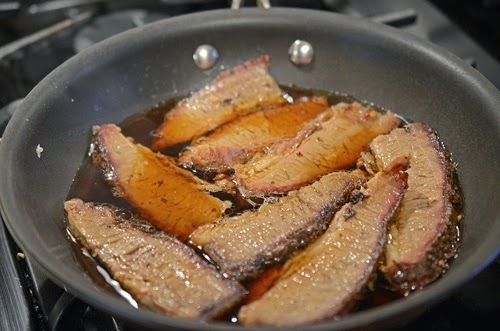 But with just these few changes, lately I have been getting noticeable smoke rings to go with our tasty and tender brisket. 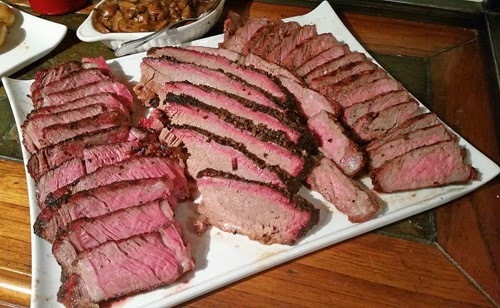 Our Thanksgiving main course was reverse seared ribeyes (left), smoked brisket (middle), and grilled NY strip steaks. 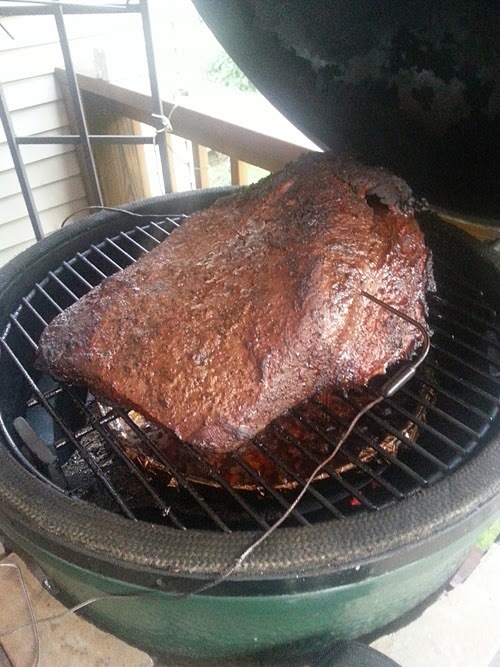 Notice the smoke ring on that brisket. I never used to get that pronounced of one unless it was from our offset trailer pit. Low at first, even if hot and fast later - I have found that regardless of low and slow or hot and fast, I still get a good smoke ring if I keep my kamado cooking temp at the grate level around 210-215°F for the first two hours. When I start off at a dome temp of 250°F or higher from the beginning, it still tastes smoked but the smoke ring isn't as pronounced. Moisture - kamado grills deliver juicy meat but to get "dat smoke ring", the air in the cooker needs to have moisture to help the nitrogen dioxide in the smoke change into a nitrite compound that will react with the myoglobin in the meat - stabilizing it as pink - while the rest of the meat browns from cooking [Horribly paraphrased from Harold McGee's On Food and Cooking, but excellent book, highly recommended]. So instead of just putting a drip pan in there to protect my plate setter from the drippings, I fill the drip pan with liquid. 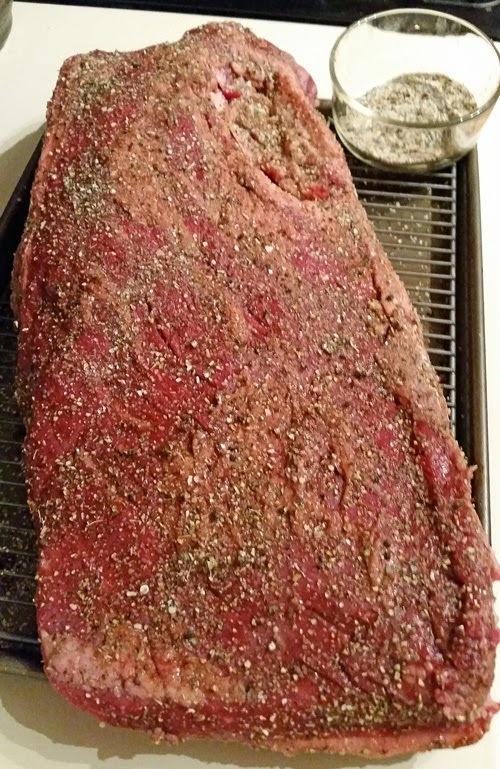 Coarse rub - not sure how it is involved yet, but I notice that when I use my normal beef rub finely ground, I don't get the same ring that I have been getting from when I just crush the black peppercorn, green peppercorn, dried garlic, dried onion, and dried red and green bell pepper - then add the salt. The coarse texture reminds me of how the spices look for a corned beef, so maybe there is a little curing going on too. I'm not cheating and adding any curing salts. 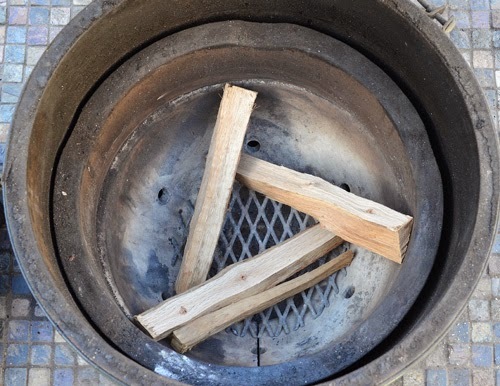 Triangle wood burn - I used to use wood chunks or chips but once had to use small split logs from my stick burner only because I was out of chunks. Got a great smoke ring so I have been doing this set up ever since. I haven't played with this enough to determine whether it is one of these things, a blend of a few, or a combination of all four. For the triangle wood set up, I put in three 13-15" log splits in like pictured below. 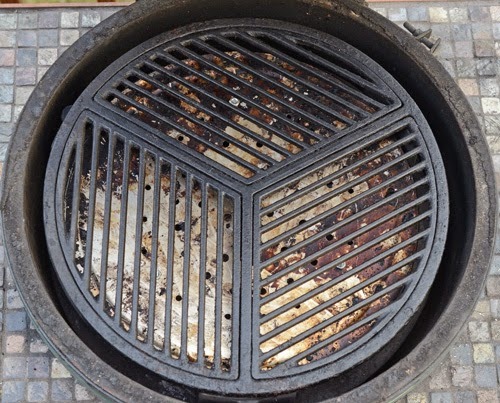 I try to rest the top end right where the firebox and fire ring meet on a Big Green Egg or just above the air holes on kamados with a single piece fire bowl/ring, for example, a Vision Classic. Then I fill in around and over it with coal. John and I think it might have something to do with getting a steady long burn although if you are mixing up the same quantity of wood chunks in with your coal, you should get the same result in theory. Whatever, this works so I'm sticking with it. 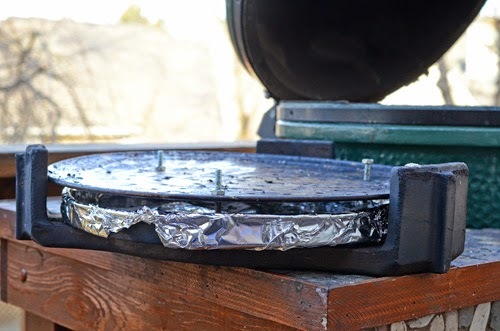 I mentioned in a previous post that I am experimenting with a tuning plate on the kamado grill, much like stick burners use to even out hot spots. 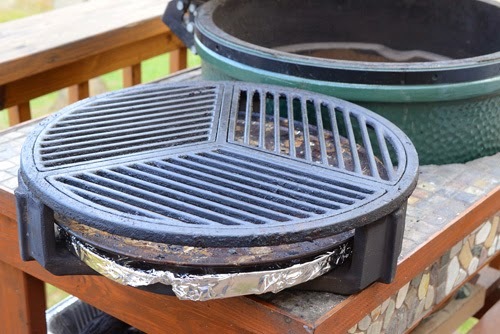 The Big Green Egg and other kamados heat relatively evenly, but there are open spots around the plate setter or heat diffuser that allow radiant heat to come straight up and hit any meat directly above those gaps. It's a real pain with ribs or brisket where the ends have to go over these spots. 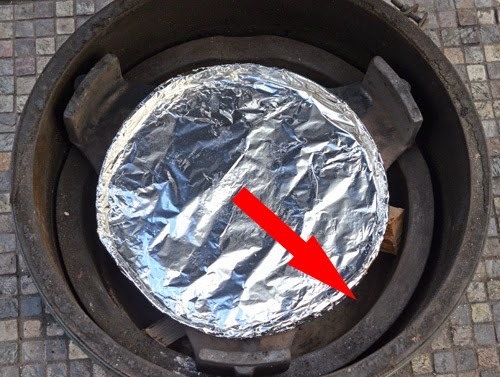 All of the heat from the fire box below has to come up through these gaps as pictured by the red arrow. So to block those gaps, I made a tuning plate out of a 16" pizza pan that fits above my plate setter and drip pan like this. This way some of the heat and smoke is deflected outwards, some is deflected towards the middle where it can come up through the holes. It doesn't block anything - it just redirects. From the side, the set up looks like this. I used three bolts as legs to hold the pizza pan above the drip pan. It works with a plate setter and a Craycort Cast Iron grate system. 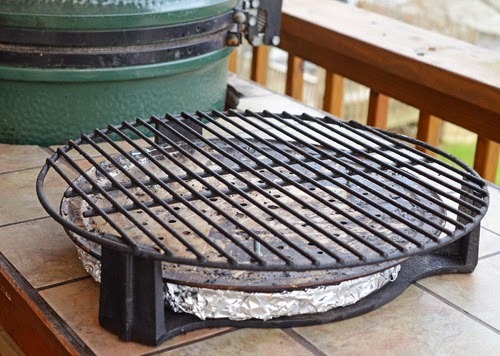 It also works with a cast iron plate setter and a standard grate. So when all of this is put into the kamado grill, it still has plenty of room for air to circulate. The drippings that fall onto the tuning plate pretty much drip down into the drip pan below. The few drips that don't drip down harden and are easy to knock off with the grill brush scraper. 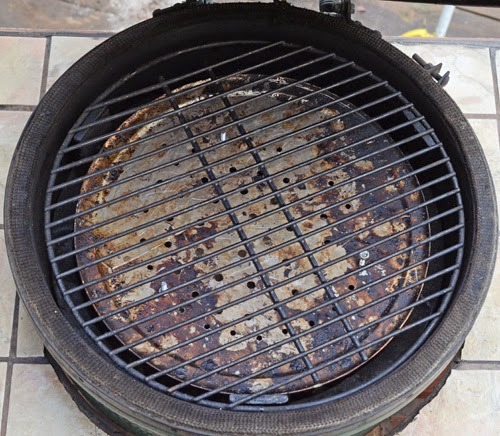 So is a tuning plate for a kamado grill necessary? No but it is definitely an improvement when indirect cooking large cuts of meat that hang over the gaps, in my opinion. No charred ends. Total cost was less than $10. Like most everyone, I trim the fat cap down to 1/4" or less. On the other side, I also cut out as much of the hard fat between the point and flat that I can get to. A flexible, sharp boning knife helps. If this was competition, you would clean up the sides too but this is an eatin' brisket. 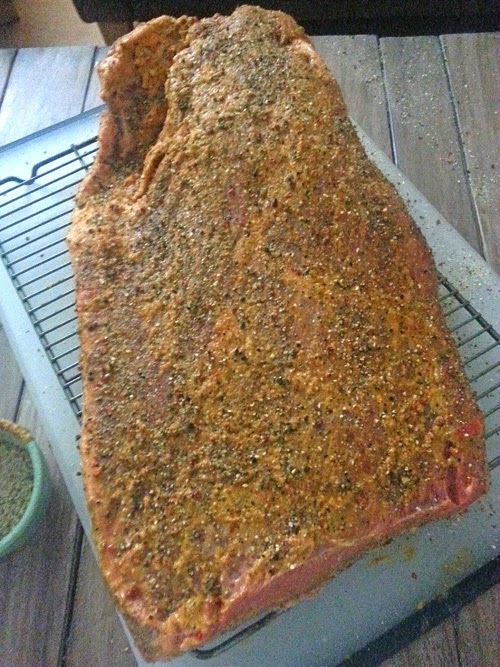 I use a slather to help the spice rub adhere to the brisket. Sometimes I'll just use the injection liquid that leaks after injecting and rub it all over before seasoning. Sometimes I'll use a quality, highly seasoned mustard like El Dorado Mustard (The Mustard that Bites Back!). Other times I use Chris Lilly's method (Fantastic book - get it if you don't have it) which is a paste of beef bouillon or beef base mixed with Worcestershire sauce. 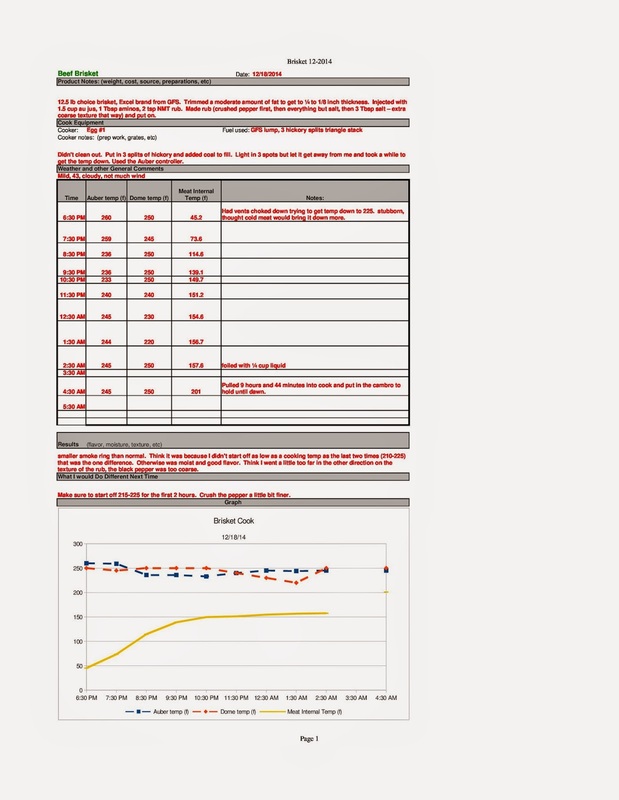 Notice the gap towards the top - that is where I cut out the hard fat between the point and flat. This was one before using the tuning plate. 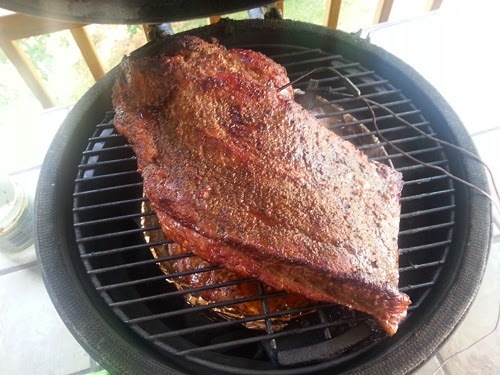 Look at how much of the brisket is over the gaps. 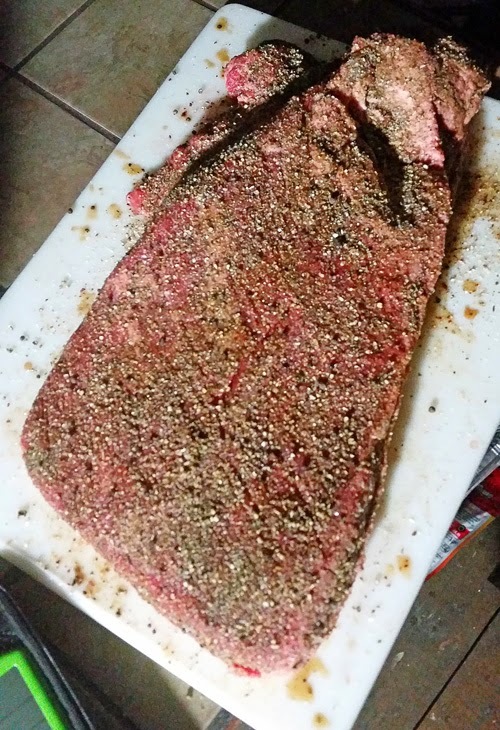 Briskets shrink up a lot when you cook them. Don't panic if they are almost too big to start with. 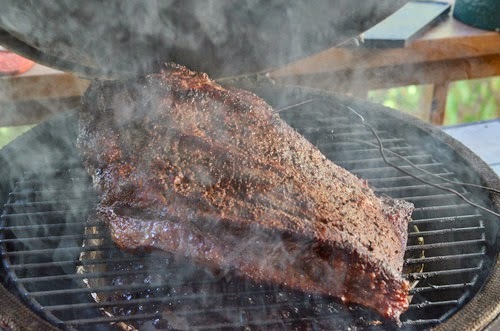 This is the same brisket as the picture above this one, just later in the cook. Brisket hiding out in the smoke. 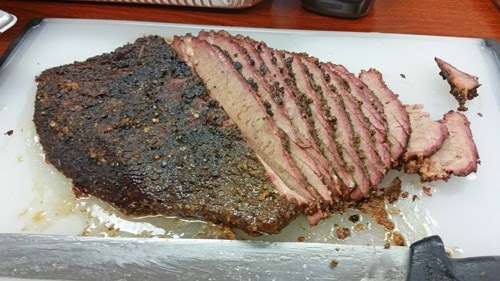 The last brisket I did was for our office Christmas party and the theme was "come as you are" so everyone wore pajamas. I found the goofiest PJ's I could, a great big onesie. 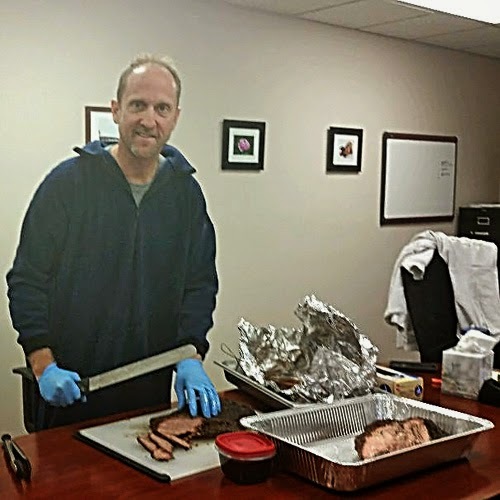 Here I am slicing brisket on the meeting table in my office. Too hilarious not to post this. The only thing different between this brisket and the Thanksgiving one posted earlier was that this one started off cooking at 250°F while the other was 215°F. Notice that this smoke ring is okay but not as defined as the Thanksgiving one. Warming up the leftover brisket - slow, gentle and moist is the way to go. Here are the meat logs from a few of my recent brisket cooks. 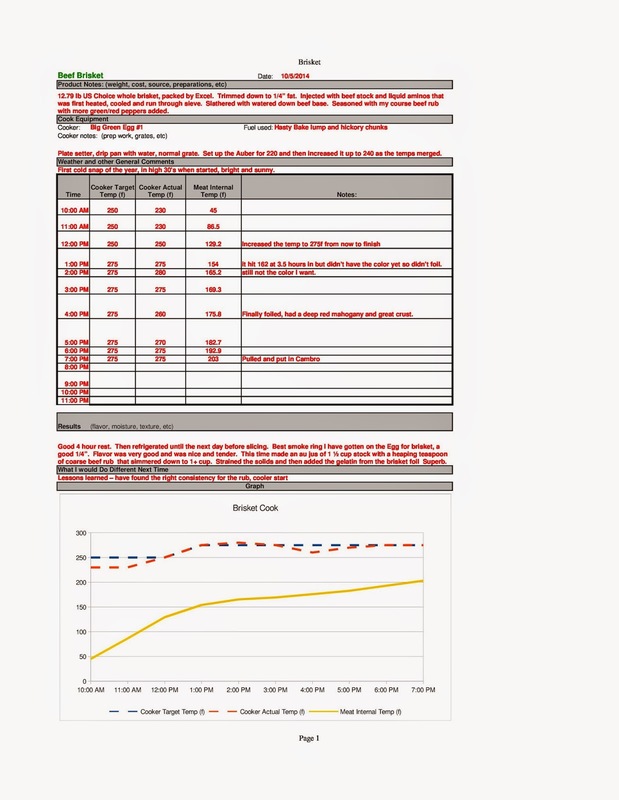 If you don't already take notes for your longer cooks, take a cue from Meathead at AmazingRibs.com and start doing it now. You will learn so much more by analyzing your various cooks and you can use them later as a reference. I thought the last one was interesting because you can see it stalled out lower (150's) and longer (hours) than the other two but at the end, the temp shot up 50 degrees in two hours. 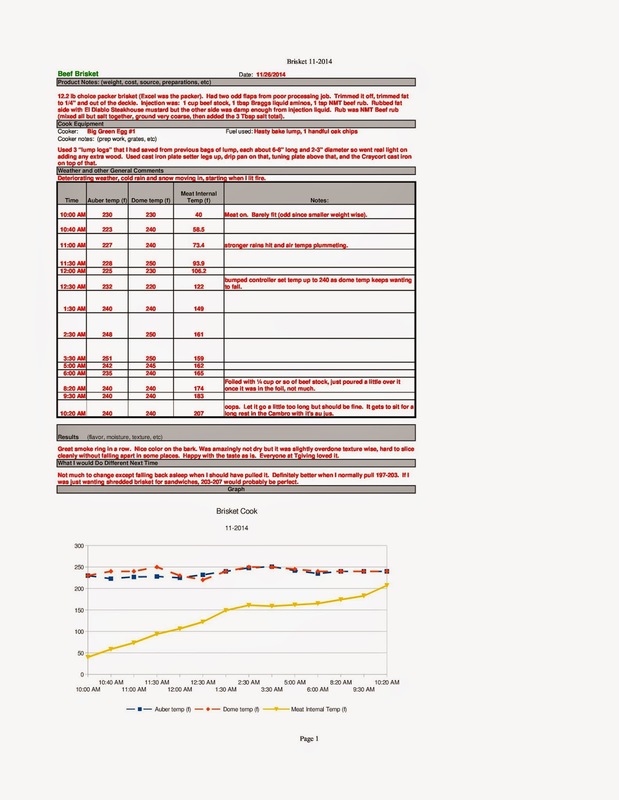 (I slept through a data point which is why there is a gap.) Just goes to show, every cook can be a little different and that BBQ is ready, when it is ready. Gotta run....I have got that 12.6 lb brisket waiting in the fridge.